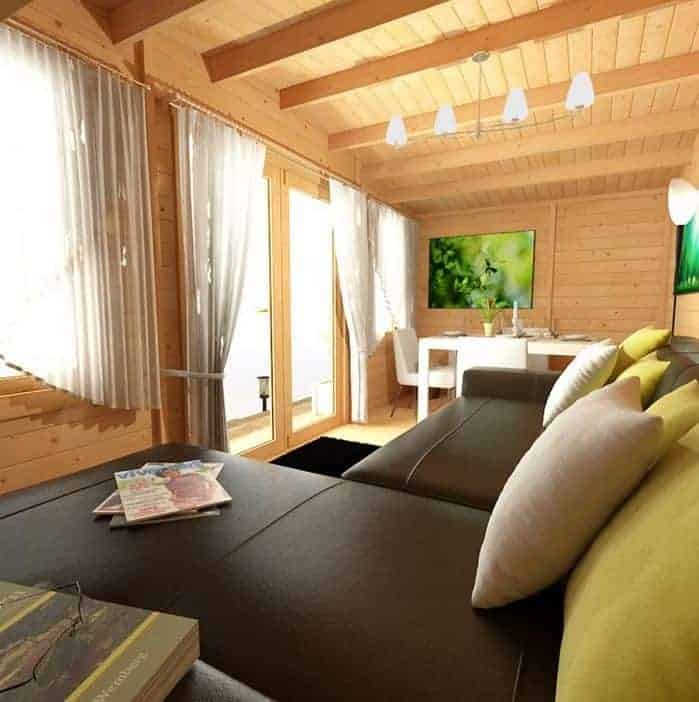 An attractive Alpine style log cabin. There are some good options, such as extensive customisation for cladding, and the building has two opening windows. Roof thickness is also customisable, which again adds value. It is a wide building too, which means you have a certain amount of space built in. Shed type and roof and size. 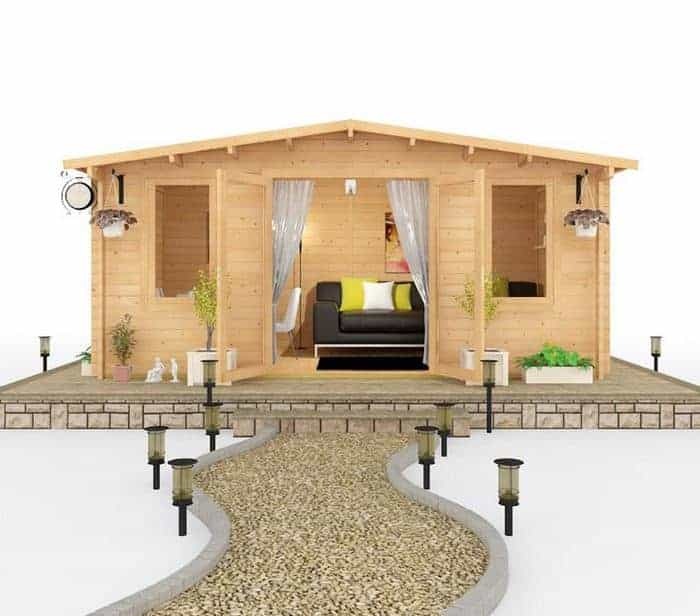 This is another of the famous ‘Alpine Style’ log cabins, and as such it looks fantastic. 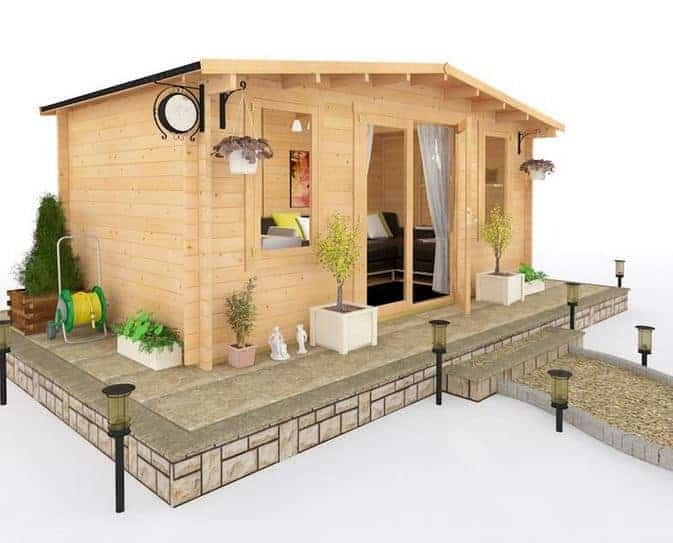 If you like Alpine cabins, this is a good-looking and aesthetically pleasing model. The roof on the building is immediately attractive, and gets your attention straightaway. With a nice high roof you get the accompanying ceiling height inside. That means high and spacious, and it makes a huge difference to your enjoyment of the cabin. On a technical level, the width of the building is 521.75 cm and the depth is 293 cm. Internally, things are a little different. It’s always a good idea to bear in mind that internal measurements are different to external. The materials involved in the build affect the internal space to a degree. The internal width of the model is 473.4 cm, so you lose nearly 50 cm inside. With the 5.0 x 3.0 m model you have an internal depth of 233.4 cm. This is a 60 cm loss in depth, which is considerable. This is not avoidable, probably, due to the materials being used, but it is still a chunk of depth gone. The roof of the building provides you with plenty of choice in the covering areas. The standard roof that comes with the building is 11 mm tongue and groove. Perfectly adequate for most weather types, it is a good job. Up the stakes a little and you can pay £130 for a 19mm thick tongue and groove roof and this is most definitely worth it, with not far off twice the thickness, and that tongue and groove work providing high quality, smooth interlocking surfaces. The building has tongue and groove cladding. This is a mark of the quality of the build, and it shows that the manufacturer has made a conscious effort to provide a basic standard of quality. Tongue and groove cladding simply interlocks, and you really can’t get a tougher standard, at this price anyway. They add more to the equation by giving you multiple options on the cladding thickness. 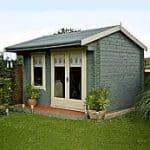 So if you take it as a standard cladding style with the tongue and groove, you then have the added bonus of choice in the thickness on top of that strong outer covering. The standard cladding thickness is 28 mm. This is good stuff, and will keep the rainwater out. It doesn’t match up in thickness and quality when compared to the next level though, the Premium. The Premium cladding is 35 mm thick. 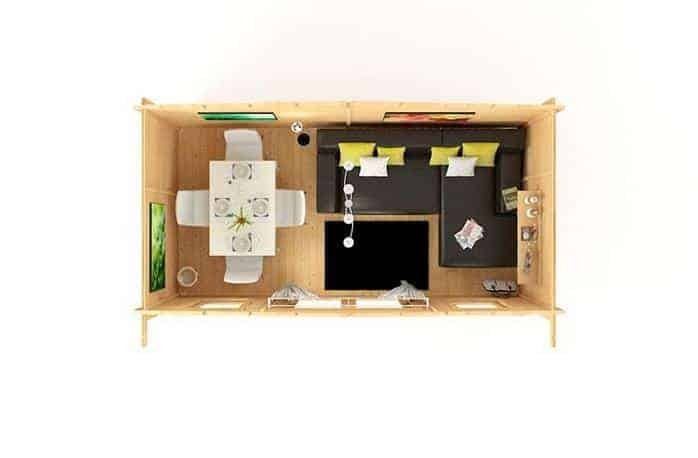 This is ideal for larger buildings. 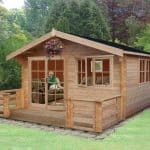 We think this log cabin qualifies as a larger building, and having the Premium makes a difference to that longevity. It’s just thicker wood with more timber per centimetre. But they really up the ante with the Ultimate cladding choice. This level gives you 44 mm thickness and double tongue and groove. 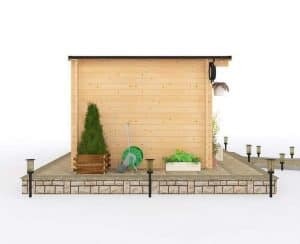 So you have a strong, year-round level of protection, perfect for this building. Our take on this? If you can afford it, go for Premium at the minimum. It’s all about toughness and longevity, and you can’t cut corners with a building of this size. The flooring has a good set of options as well, starting with basic bearers, with you having to lay down your own floor. Interestingly, the manufacturers make you pay for the basic floor at £95. There is nothing fundamentally wrong with this, but you literally will not have a floor unless you pay an extra £95. You could say this is an expected cost or you could say that they could give a little leeway and offer a lower price. Then there is the Premium floor option at 19 mm thick. This is a little pricey at £140, but when you consider that you are getting a floor that will last for a very long time it makes sense. We just get the feeling that a standard floor could have been included as part of the package price for the building. Alternatively, you could just look at it as an expected cost. But bear in mind that you will literally have no floor otherwise. No treatment is supplied at the factory, so you are left to your own devices here. 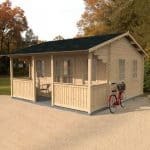 There is a simple solution, and that is to literally treat the shell and frame as soon as you receive the model you buy, but again, it is important to remember that this a vital job, ad if left untreated you will have a cabin that quickly falls apart. 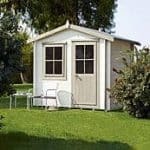 We like the fact that the model has two opening windows, This adds a lot of value in that you have ventilation whenever you need it, and there is plenty of fresh air available through the two openers. Thankfully, the building has standard single glazing fitted, but it is toughened glass, so you have an element of value there. Step it up and you can have double glazing, which offers that warmth and noise protection throughout the year. We found the double glazing to be almost a given, due to the fact that most people would treat this building as another room to their home. Double glazing is therefore important. You have the modern style or the Georgian Style. Both styles are strong, and do not affect the quality. It’s just a matter of taste. The security of the building is enhanced by the glazing. With the single glazing option being a toughened one, you get a great quality building that will offer plenty of protection. There are many aspects of this building that are customisable, and this is a key feature. But when you think of the word ‘custom’ you initially think of choices, and with some of these, there really isn’t any choice. We think there are two ways looking at it. You can view a customizable aspect as being something that is ‘nice to have’ or as something ‘essential’. And the fact that you have to pay for a floor is falling into the ‘essential’ pile we think. There is a lot to be said for the Ultimate in cladding though. The manufacturers recommend that you need to consider this level for large buildings. While this building may not be the largest they sell, it does benefit from the Ultimate cladding option. And that is both a ‘something nice to have’ and an ‘essential’. 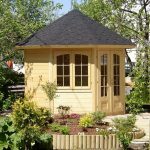 We also like the fact that you can have a shingled roof. It is not essential, but does add more protection for the interior. Final Thoughts: A lovely building that looks amazing. That’s our first reaction when we think about the log cabin. There are couple of issues here though, and we get the feeling they are going to prove to be a little challenging for some people. First of all, we weren't too impressed with the loss of internal space in the cabin. This is unavoidable, arguably, due to the materials being used, But you lose around 60 cm, and this is a big deal to us. Then we couldn't quite get over the floor issue. Having to pay extra to have a floor doesn't really make sense to the everyday DIY person. If you can’t choose your own custom floro, you have to pay extra for one. Interesting. But it can’t be denied that it looks great, and that this counts for a lot. 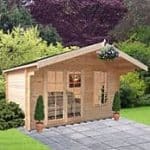 It’s tough, and when it is fully customised and at the top spec, you’re looking at a building that is a great addition to your garden, and perfect for entertaining.